Fabritopia...living the dream (one day at a time)! - Stop staring and start sewing! Well today is the first anniversary of the day I actually hit the "Publish website" button and went live with Fabritopia. I was scared to death when I pushed that button. I had been sitting there tinkering with, paying for, and shrinking back from the site for months so it was quite a leap of faith for me. My fears were realized when the 2nd order was for a whole bolt of fabric (I didn't have that much!). I quickly realized I needed to figure out the inventory page. It turns out I needed to figure out a lot of things (and still do!). I have to say it was a strange year in which to open a business and I'm so glad I didn't over-think the whole thing because I may have ended up scaring myself out of it. Everything started out great and then when the stock market started tanking in October so did Fabritopia. Turns out it wasn't just my fabric store that had a little set back, every store owner I spoke with was dealing with the same thing. 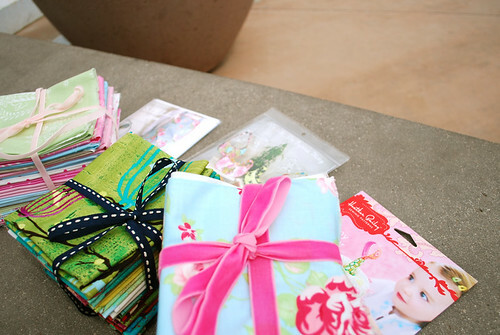 But in November everyone decided they still loved fabric so I breathed a sigh of relief and kept on ordering. So far so good. I want to express my gratitude to all of you who have supported me this year by buying fabric, giving me great ideas, sending wonderful notes of encouragement, and just being friends. I stand by me belief that people who love fabric are the nicest people out there! Thank you for being patient with me too and realizing I'm just one person here and not a mega store with a mega staff. I wish we could all get together in person some day and just chat in real life. I put together some goodies as an expression of my thanks and a celebration of Fabritopia's first birthday. I wanted to put together the sort of things that would make a shopper leave a fabric store with a big smile on her (or his! I know you guys are out there too!) face. So I have 3 delicious stacks of sweets. I'm going to pick 3 winners. First prize gets first pick, and so on.... I'm not letting random.org pick this time. I'm going to pick the best comments based on my own personal preference (make me laugh, make me cry, confuse me, whatever, just be impressive). All I ask is that your comment rhyme. Yes, it has to be a poem. I don't care if it's 2 lines or 16 lines. 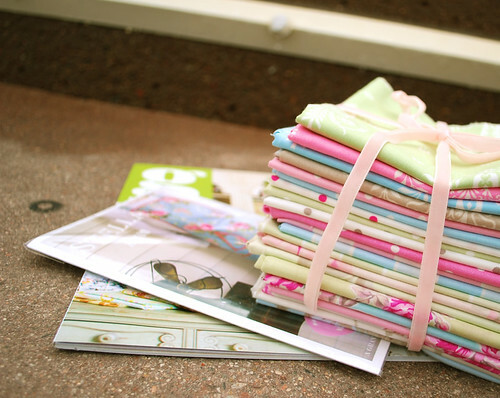 Okay, stack one: Fat Quarters of the entire French Hatbox line by Tanya Whelan (who's fabric designs are as sweet as she is!). Also, one of her Stella Apron patterns (which is guaranteed to make you feel cute while you're baking a pie, it says so!). 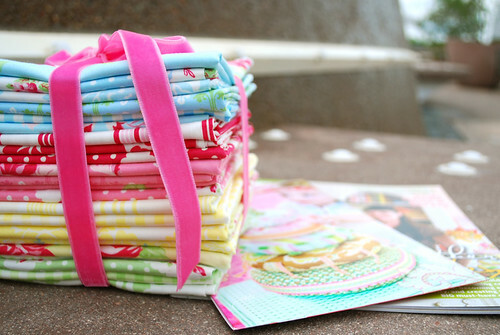 Stack two: Fat Quarters of the entire Lantern Bloom line by Laura Gunn. This line is hot off the presses and I'm hoping Laura is already cranking out another one because her style is unlike anything else out there (and she's a sweetie too!). The pattern is Kay Whitt's lovely new Sylvia Sling pattern. 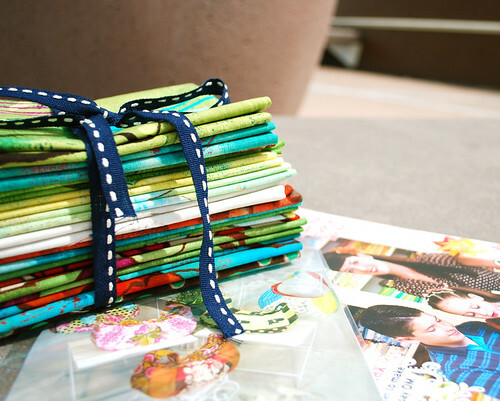 Stack three: 24 Fat Quarters of Tanya's beloved Darla line. I know this one's been out for a few months but people can't seem to get enough of it so I had to include it. I thought it would look beautiful with Heather's Happy Stacker pattern so I've included it. Doesn't this look luscious? Yes!! THANK YOU!! TRULY, FROM THE BOTTOM OF MY HEART!